In many cases, the primary goal of your PURL campaign is to track who’s responding online from your direct mail campaign. In this post we’ll explore some possible “secondary” goals of your campaign, and how to structure your PURL landing pages, to accomplish those goals. First of all, if you’ve used PURLs in the past, it’s worth taking a moment to remove of any pre-conceived notions on what a PURL landing page should be. The “old” strategy was to send the PURL visitor to a welcome page where we “shock and awe” them by displaying their name, then link to a questionnaire where we bombard them with several questions, then to a “verify your contact info” page, and finally to a thank you page where they get a free $5 Starbucks card. Woo Hoo! This is ridiculous. This does not work. If you’re doing this, stop! If you don’t have the email address of your visitor, chances are this should be your secondary goal. Email addresses are vital for continuing to engage your prospects online. If your secondary goal is to capture the visitor’s email address, then the email should be the only input on your PURL landing page. No surveys, questionnaires, or “verify your information” forms. I know I know, it’s tempting. “Ahh… but what’s a few more form fields?” you ask. The more information you ask of your visitor, the lower conversion rate will be. Give the prospects a good reason for them to hand over their email, and ask nothing else of them. This is a great use of PURLs, and where I’ve seen the highest response rates. I’ve seen this a lot with Auto dealerships inviting prospective car buyers to an exclusive event. Generally, these lists are to people that already have some sort of relationship with the business, and thus, much more likely to respond. In these landing pages, it’s good practice to only show two buttons “Yes” and “No”. You may also opt to ask the visitor a couple other questions to help validate the prospect. The portal strategy is used to provide the PURL visitors with information that is specific to them. I’ve seen this used a lot in education recruiting. If you know a visitor is interesting the Biology and Football. Show them information about the campus around these topics. Another common practice with this strategy is to provide a checklist. The visitor check items off the checklist as they are completed. And re-visit the page to receive updates and continue the process. I’ve also seen this used for financial planning, where retirees were given a checklist, with specific due dates depending on their age. Helping the visitor to plan for retirement. These visitors return back to their PURL often to check in on their status, and continue to receive updated, personalized information. This was part of the old PURL strategy that we had to debunk at the beginning of this post. But by itself, a questionnaire is a very valid reason to use a PURL. There may be times when asking several questions about the visitor is warranted and part of a larger strategy. But if getting visitors to complete a questionnaire is your secondary goal, it should be the first and only thing that the visitor sees. Don’t show them a welcome page, and then continue on to a page to verify their contact information. That’s just annoying. I don’t see this one used very much at all. But it’s very similar to the questionnaire. Generally, the contact info fields would be pre-populated with the information you already know about the visitor, making it very easy for them to verify and/or update their information. Having none of the secondary goals is just fine, and is actually very common. The primary goal should be to simply track who’s visiting. In many cases, that’s all that required. If that is the case for you, it is absolutely acceptable to pass them along to an existing website or landing page. This is often what I suggest to those looking to give PURLs a try for the first time. Personalizing the landing page adds complexity to the project. And keeping things as simple as possible, especially when just getting started with PURL campaigns, is very important. Of course, this is by no means an exhaustive list of possible PURL landing page formats. If you have other formats that have worked well for you, please share them! If you’re interested in using PURLs to increase response rates, you’re setting yourself up for failure. From my experience PURLs do not increase response rates. Those that tell you otherwise, are trying to swindle your money. The primary goal with your PURL campaign should be to simply identify who’s visiting, and then continue to engage those people until they convert. Let’s break this down a bit… Say that you’re going to send out 1,000 direct mail pieces. It’s possible that you’ll get 50 that visit their PURL. Of those 50, 3 will “convert” by submitting their information. The value here is in the 50 that visit the PURL. The 3 that convert are icing in the cake. The 50 is how you evaluate the overall success or failure campaign. In many cases, PURLs are used with direct mail campaigns. And if you’re using direct mail, chances are that it’s one of your first “touch points.” Prevailing wisdom is that it takes 6 to 8 touches to generate a viable sales lead. So to evaluate your direct mail campaign based on the number of people that immediately convert, is really, quite ridiculous. With PURLs, you will be able to see exactly who those 50 people are that responded. Successful marketers are placing value on these 50 people, because they understand that this is only the first of many touch points. They are using PURLs to identify those that have shown some interests in their offering, and continuing to engage them until they are ready to convert. This is where the primary value of PURLs lie. I’ve seen an increase interests lately in integrate PURL activity directly into Auto Dealer CRMs (such as elead-crm.com). After having built out a few of these now, I though I’d share and document the process here. The Auto-lead Data Format (ADF) is the standard format for sending leads to Dealership CRMs. In this process, an XML-formatted email will be sent to the dealerships CRM email address. The CRM will then accept the email, and enter the the visitor’s data, instantly alerting your sales team. You can quickly integrate this into your existing Purlem campaigns with a few simple steps outlined on our GitHub page. Let me know if you would like some help integrating this into your next PURL campaign. Hubpost’s Identity Tracking allows you to track exactly who is visiting your website from an email link. But what if your using direct mail to drive people to a Hubspot landing page? The best you can do here is to use Hubspot’s Custom Short URLs. But these Short URLs will only tell you how one campaign is performing vs the other. It will not tell you exactly who is visiting from your direct mail piece. And when “Joe” (in our example) visits his PURL, he will be tracked, and immediatly redirected to your Hubspot page. Downloading a report from Purlem, will show you exactly who visited, and the date/time of their visit. 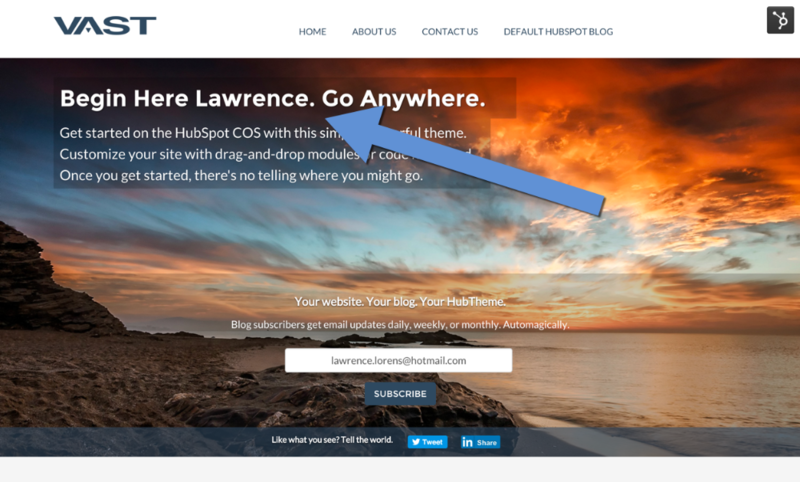 If you’d like, you can also personalized your Hubspot page to the visitor. Possibilities here are endless, but welcoming the person by name is a common practice. Finally, you can also use Purlem’s Zapier integration to pass the PURL results back into Hubspot. This allows you to see your direct mail visitors directly in Hubspot’s platform, and trigger future marketing based on that data. Using PURLs as a means to increase response rates is the “traditional” way to use PURLs. But, after seeing hundreds of PURL campaigns over the last several years, I’ve found that this is one of the worst ways to approach PURLs. Let’s see how the traditional route typically plays out…. You have a list of 1000 potential customers that your excited to send a direct mail piece to. The goal of the campaign is to get people to fill out a questionnaire, in exchange for a gift card. You decide to add a PURL to increase the response rates. After dropping the cards in the mail, you site back, put your arms behind your head, and hope that your server doesn’t drop from the masses that will surely start streaming into your site. Of the 1,000 that received the direct mail piece, 20 people visit their PURL. Of the 20, 2 filled out a questionnaire to redeem the postcard. So was this campaign a failure? With this traditional approach – you bet! Those damn PURLs were suppose to generate a 30x response rate, and all we got was a measly 2 people to fill out the questionnaire! This approach is what pissed off so many printers over the years. Let me share with you an industry secret. PURLs will NOT increase your response rates. Okay, sure, we’ve all seen those case studies where PURLs generated a 100x increase in response. But these are the exception, not the rule. Sure, there are instances where PURLs do increase response rates. But there are also times where PURLs decrease response rates (It’s just that nobody wants to talk about those campaigns). At the end of the day, it’s safe to assume that PURLs will have no effect on your response rates. Instead of focusing on the response rates, you should focus on using PURLs as a simple way to connect the offline and online worlds. Without a PURL, the prospect that received your postcard, and visited your website is anonymous. We have no idea who he/she is. However, with a PURL, we know exactly who is visiting. The ability to to identify your website visitor from an offline marketing piece, is what makes PURLs valuable. Not the hopeful increase in response rates. Let’s take a different approach with the same campaign as above – You send out the same 1000 postcards, and the same 2 people fill out the questionnaire. However, we also had an additional 18 people that visited the site, but did not fill out the questionnaire. It’s quite obvious right? In most cases, a direct mail piece (with PURL) will be one of the very first touch points. It is very likely that the recipient has never heard of your product/service before. Chances are, the they are not ready to fill out a questionnaire, let alone buy your product. Tip: If you don’t have yet have the email addresses of your PURL visitors, it is imperative that you ditch the questionnaire all together, and simply request an email in exchange for you offering. You’ll see why in a bit. Back to the campaign.. These 18 contacts are extremely valuable. Essentially they have told us that they are somewhat interested in what we have to offer, but are not ready yet to pull the trigger. With the traditional approach to PURLs, these contacts are very often forgotten. With our improved strategy, it’s just the starting point. 980 People that did not visit the PURL. 18 People that visited the PURL, but did not fill out the questionnaire. 2 People that filled out the questionnaire but did not buy (but we now have their emails). It is now our job, to take each segment and encourage them individually down the sales funnel using a variety of online and offline marketing tactics. Here are some things we can do for each segment.. Tip: I want to draw special attention the custom audiences listed just above here. Custom audiences are an awesome new feature that has recently been rolled out by Facebook, Twitter, and Google. What custom audiences allow you to do is target people on all of these platforms by their emails! This is huge. No more guessing who your marketing to. Now, you can market directly to your prospects that have shown interests by visiting the PURL, but have not yet converted. This is why it’s so important to ditch the questionnaire, and simply request emails from your PURL visitors. Over the next few months, we apply a variety of the above tactics to our example campaign. If you do the same, you’ll start to see how people you initially reached out to a few months back from your PURL campaign, finally start converting today. An obvious next question to ask is – How do you know if a person that visits your site today, initially came from a PURL campaign several months ago? For example, if our friend (who we’ll call “Joe”) visits his PURL, we can obviously track that he visited that particular PURL page. But what if several months later Joe returns to our home page? How will we know that Joe is back? The answer is Tend. For the past year I’ve been working with Ryan to create solution to that will easily track PURL visitors, forever into the future. Tend picks up where Purlem leaves off. It’s Purlem’s job to bring the offline prospect online, and identify him. It’s Tend’s job to continue to track Joe forever into the future. With Tend, you’ll see a timeline for each of your PURL visitors. Starting with the initial PURL visit, and ending with a conversion. It could look something like this. In this example, Joe visited from the PURL 6 months ago. This is when we first identified him. Since then, we continued to market to him on a variety of online channels. Two months later, he came in through Facebook. And yesterday, he finally contacted our sales team. So the lesson in all of this is to forget the response rates. Instead, use PURLs as a starting point. A way to bring an offline prospect online, track him, and continue to market to him until he/she is ready to buy. After a trial period, we ended up removing the email marketing feature from Purlem. We “soft released” the feature a couple months back. We didn’t advertise it as a feature, we only listed it on the user’s dashboard. It was a way to test if any existing Purlem users were interested in it. We ended up having a grand total of 2 people want to use the feature. And underwhelming result. However, the “minimal” nature of the feature probably raised more questions for a users than providing an obvious solution. To give this feature the opportunity it deserves, we would probably need to build a much more robust email platform. So we’re not giving up on this idea yet. If your interested in using Purlem to send out mass emails, contact us. We’d like to hear from you. Delegating work is one of the hardest things for me. I’ve said before that it’s probably my worst trait as an entrepreneur. I know it’s the right thing to do. I know I should be doing more of it. It was even one of my new years resolutions. But there’s just something holding me back from being able to effectively delegate. I think it’s a couple things…. It takes a lot of time to teach somebody else how to do something. Way more time than just doing whatever it is. And then you need to make sure that you have enough work to keep people busy. If your bootstrapping, and the money is coming directly out of your pocket, busy work doesn’t make sense. You have to make sure that your delegating work that is making a difference. So far with Purlem I’ve been my only full-time “employee.” I’ve given it a shot here and there to delegate out work. But nothing has ever stuck, probably caused by a combination of the things above. So I’m faced with two options with Purlem. Continue to path as a solo entrepreneur, and see how far it can take me. It’s done me well so far. Hire somebody that can help out with some of the things that could contribute to Purlem’s growth. I’m leaning towards hiring somebody. There’s not enough work for a full-time gig. But there is certainly things that can be done. From improving the help section, to helping design and develop custom PURL landing pages. If you know of an aspiring web design guy/gal, eager to learn, with a keen eye for clean design, let me know. Reddit: Can we talk about PURLs? I’m one of those PURL companies that “hopped on the bandwagon” several years back (not one of the companies mentioned here). You will not hear me tell you that “PURLs are all the rage and super effective,” nor will I be clamoring of your business. PURLs are, however, what puts dinner on my family’s table. I’ve seen hundreds of PURL campaigns and techniques over the years. I have seen the fad come in go, specifically in the print world. During this fad, printers were ineffectively using PURLs as a gimmicky way to increase response (which doesn’t work). This fad is what led a lot of people to look at PURLs as “trite, inelegant and inauthentic.” Using PURLs as a gimmicky way to increase response rates obviously does not work, hence the busted dreams of so many printers, and the decline of the fad. But as that fad declined, another, more strategic use of PURLs started to emerge. As ifeelhome mentioned – using PURLs as a means to track and follow up with prospects could be a strategic and effective way to use PURLs. Sure, there are many site visitor attribution tools out there like (such as al_manchester’s Woopra), but these tools will not tell you the exact name of the visitor, unless you somehow tell the tool who it is. With direct mail, your only option to identify visitors is by using PURLs (for now anyways). So psychdelight, you can let you boss know that by themselves, PURLs will not make you a ton of money. They are simply a tool that has the potential to enhance a campaign, where it makes strategic sense. Ok guys. This has been a feature you guys have been asking for a while now! As of today, you can now create multiple “rules” to redirect PURL visitors to specific pages, based on their answers. UPDATE: This feature has been retired. Before today, sending out an email marketing campaign with Personalized URLs (PURLs), has been a tangled mess. You would first have to upload your list of contacts into Purlem, export the list back out, upload your Purlem list into your email marketing platform, and “mail merge” the PURLs into an email template. That, is not fun. To get started, select the “Email All Contacts” link from the Contacts page. Then, compose your email. You can personalized the email with the “Insert” dropdown, just as you would the landing page. From there, we will personally work with you to test, send and track the email. The cost? 1¢ per recipient.